Water can add another dimension, bringing light, sound and movement into a garden. 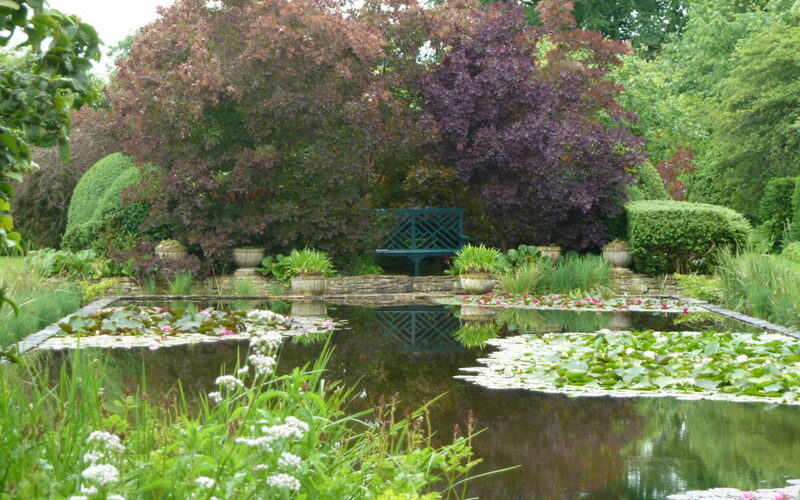 In large gardens ponds and streams work well in an informal more natural setting, with the added benefit of attracting wildlife. 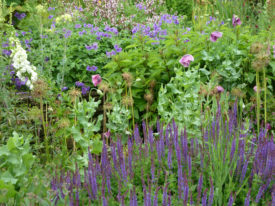 While in smaller gardens a rill is an effective, low maintenance way of introducing water. Garden structures can add instant interest within a garden through height and structure. This could be a summerhouse, offering a sheltered spot in the garden in which to sit, relax and enjoy the view of your garden. Paint these a neutral colour (soft sage green or a cream) to harmonise with the landscape. In smaller gardens a pergola or arch could be included. Pergolas can be entwined with roses, honeysuckle or clematis and painted to compliment or contrast with the planting. Any sized garden can be enhanced with the addition of a few objects which reflect the personality of the owner, for example; pots, statues, structures and sculptures. When strategically placed these can draw the eye away from unsightly features, such as a wall or neighbouring buildings. They can also be positioned to provide a vista, for example at the end of a pergola. Any chosen object must be appropriate to the location, and its colour and texture should blend with the rest of the hard landscaping (house, paving, walls etc.). 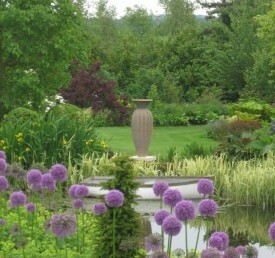 Gardens are meant to be viewed so seating is an important element of a garden. 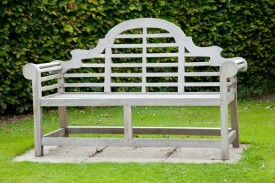 Seating can entice visitors into the garden or down a path. It can be purely functional or used as a focal point. Seating can also have other practical uses, for example box seating with a hinged lid provides additional storage space. Built-in seating, next to a raised bed, makes an attractive feature and avoids the problem of storing furniture over winter. Seating could also be used as a centre point to balance a particular area, for example in a formal garden where symmetry is important. Entertaining is one of the best ways to use and enjoy the garden, no matter how small or large it is. There are numerous options for the flooring; you could opt for natural stone paving, brick, concrete or decking. When selecting the appropriate material choose something complimentary to your home and the other hard landscaping elements. Shelter is another important consideration, as you will want to be able to use the area come rain or shine. Options here include a pergola, gazebo, shade sails or umbrellas. Wildlife requires two fundamental things: somewhere safe to breed and shelter and somewhere to forage throughout the year. A lawn, trees and shrubs, flowers and water are key habitats. A water feature with different depths provides areas for birds to bath and drink, and somewhere for amphibians to lay eggs. A thick thorny shrub bed or hedge provides nest sites. Early and late flowering plants provide nectar for insects; fruiting bushes are a good source of food for birds and mammals during autumn and part of the winter. Wildflowers will provide a beautiful splash of colour and attract spring and summer butterflies to your garden. You may have a tired looking border that needs to be refreshed. 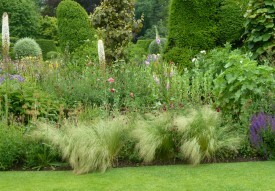 This is an opportunity to plan the border so that you have all year round interest. Plants change with the seasons, and different types of plant have their roles to play at different times of the year. Trees create vertical interest and provide structure above eye level, shrubs provide the framework of the garden, and perennials, annuals and bulbs contribute seasonal colour in the foreground and add interest to the lower layer of the picture. The styling of the planting and its overall shape, colour, and texture should relate to the style, shape, colour and texture of the garden’s structure and the interior of any rooms that adjoin the garden. Having a source of fresh fruit and vegetables makes even a small area in which a few crops can be grown a welcome addition to the garden. You don’t have to have a dedicated plot either; you could grow vegetables amongst flowering plants. Many vegetables have decorative qualities, for example red flowered beans, and crinkly leaved lettuce, globe artichokes, courgettes and asparagus. Create vertical height by including attractive climbing frames and trellis, to support peas, beans and other climbing plants. Even in more modest-sized gardens it is possible to accommodate play equipment without killing the garden aesthetic. You could for example, sink a trampoline into the ground to stop it dominating the view. This would also make it more accessible to smaller children. A shed is a good place to store bulky bikes and other play equipment, or you could screen off an area using trellis. When selecting play equipment, natural materials will always sit more easily outdoors compared to their manmade counterparts. Select wood for permanent features such as swing sets and playhouses. Children’s’ play equipment needs to be in the field of vision, but you could always introduce focal points nearby to distract attention. There are several very good reasons to have lighting in your garden. It can define the route of paths and highlight entrances. It can illuminate beds and borders, trees, pools, fountains, seating and entertaining areas, creating a magical ambience and extending the use of the garden into the night. When deciding where to place lighting it is important that it does not shine directly into visitors’ eyes. Also think about the purpose of the light, what do you want people to see. It is better not to light all areas equally, think about what you need to see first, then second. Use uplighting at the base of a tree aimed to run up the trunk and into the canopy and downlighting on a pergola to highlight the path beneath.